A former Northcliffe editor who quit after his daily title went weekly wants to create an “army of citizen journalists” after launching a new website on his old paper’s patch. Marc Astley left the Express and Echo three months after owners Northcliffe Media took it weekly last year. Marc is employing a full-time editor, full-time salesperson and part-time office manager to help him run the site, but user-generated content will also play a big part. The site, built on the Drupal platform, enables users to create their own profiles and add content. 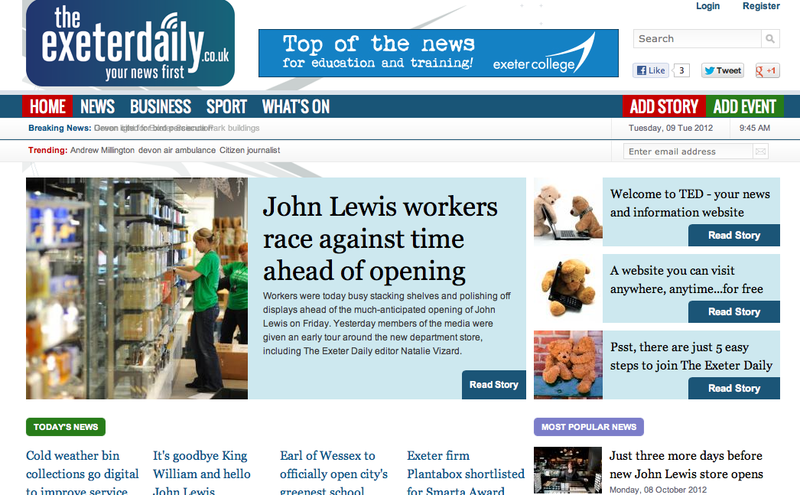 He said the site, which went live yesterday morning, would “fill a niche for a daily news service” in Exeter. Many of the daily newspapers that have recently gone weekly have argued that the need for daily news will continue to be met by their companion websites. However Marc argues that this is a difficult balance for publishers to maintain. He said: “Publishers and editors in the position the Echo is in find it quite difficult to balance the web and print. “If you have got a weekly paper and a daily website, it stands to reason you are not going to put all your best stories up online before they hit the paper. He added: “It’s about how to develop a website without cannibalising your core product and this is where publishers such as Northcliffe are struggling. The new site has an advertising based business model with three of the city’s biggest employers already advertising on it. The Express and Echo was one of four Northcliffe dailies that went weekly last year. Five Johnston Press dailies and one Trinity Mirror daily have since followed suit. So, people have been “bemoaning the lack of a proper daily news service”. The two words most likely to fill any professional full of fear – ‘citizen’ and ‘journalist’. Dad’s Army – need I say more. For `army of citizen journalists’, read scores of unpaid wannabees providing limitless free content on their neighbourhoods. Marc underplays the straight-to-the-web strategy and abilities of newspapers crewed by professionals. You can’t sit on most breaking news stories as the BBC pick them up and immediately shove them on the web if it’s something from routine sources like calls or press releases etc. Of course he’s bound to get lucky occasionally but if the story’s any good it won’t stay exclusive for long as your rivals will be following you and regurgitating anything interesting. As a reader, I know which website would be my first port of call for a regular stream of local news. It is only natural for Marc to try and overplay his hand on breaking news but at least he has a potential ace up his sleeve on the community news level. How that pans out is what really matters. Generating a sufficient level of attention in the first place seems to me the most difficult hurdle. That and then holding onto his audience. I don’t suppose the newspaper is providing their old chief’s new enterprise with the oxygen of publicity – unless they regard it as no threat whatsoever – and I don’t suppose the BBC deems it of sufficient interest to give it any kind of airing. I like his website design, kept it simple and uncomplicated – as it should be. This is all very interesting, but I just wonder if even a town of Exeter’s size can sustain the amount of staffing. It will also take a tremendous amount of dedication to defeat established media – uploading content straight after it has happened (early hours, perhaps?) lots of good photos, lots of well-written copy, nosing around for and at every event. Does the army understand the need, the need for soeed? Such a site can be popular, but making money from such a small area? Can’t see it, but this will be quite interesting to follow. Great. lots of gormless, headbanging, reactionary cobblers from sociopaths and curtain-twitchers. You don’t hear of ‘citizen’ doctors or ‘citizen’ firefighters do you. No. They are trained and paid to do a proper job. This profession degrades itself by the day. Not that’s it a profession any more. All the best, etc etc but as usual, where’s the money. I counted two adverts and the story indicates four salaries???? If there’s still a demand for a proper daily news service this is not the way to satisfy it. Flinging phrases like ‘user-generated content’ and ‘citizen journalist’ around doesn’t disguise the fact that this is another desperate attempt to do things on the cheap with people who are woefully ill-equipped deal with a rolling news schedule. Not sure the ads are going to be a great source of revenue. They don’t show up on Internet Explorer and haven’t since Day One. Would be interested to hear if others using different browsers are having the same issues. Lack of a daily news service? Err… the last I saw http://www.thisisexeter.co.uk provides a daily news service, as well as utilising content from his former paper. It’s not about ‘getting into a scrap’ at all is it?